THE SABBATH WHAT IS IT? WHEN IS IT? FOR WHOM IS IT? of the children of Israel murmured against Moses and Aaron in the wilderness: and the children of Israel said unto them, Would to God we had died by the hand of the Lord in the land of Egypt, when we sat by the flesh pots, and when we did eat bread to the full; for ye have brought us forth into this wilderness, to kill this whole assembly with hunger. “Then said the Lord unto Moses, Behold, I will rain bread from heaven for you, and the people shall go out and gather a certain rate every day, that I may prove them, whether they will walk in My law, or no. And it shall come to pass, that on the sixth day they shall prepare that which they bring in, and it shall be twice as much as they gather daily. And Moses and Aaron said unto all the children of Israel, At even, then ye shall know that the Lord hath brought you out from the land of Egypt: and in the morning then ye shall see the glory of the Lord; for that He heareth your murmurings against the Lord: and what are we, that ye murmur against us? And Moses said, This shall be, when the Lord shall give you in the evening flesh to eat, and in the morning bread to the full; for that the Lord heareth your murmurings which ye murmur against Him: and what are we? your murmurings are not against us, but against the Lord. Come near before the Lord: for He hath heard your murmurings. And it came to pass, as Aaron spake unto the whole congregation of the children of Israel, that they looked toward the wilderness, and, behold, the glory of the Lord appeared in the cloud. And the Lord spake unto Moses, saying, I have heard the murmurings of the children of Israel: speak unto them, saying, At even ye shall eat flesh, and in the morning ye shall be filled with bread; and ye shall know that I am the Lord your God.” Ex. 16:1- 12. On these verses the Friday-sabbath author’s featured thoughts are presented in the following fourteen quoted paragraphs. Tuesday, the 5th day is called Wednesday the 6th day or ‘Preparation Day.’ is called Thursday; and the 7th day on which no manna fell is now called Friday. This same relationship was maintained from Creation for we see there that the first time the moon ever registered time, which would be the first day of the month, was on the 5th day of the week. Gen. 1:14-18. “Now carefully read in review about the departure of the children of Israel out of the land of Egypt. (Exo. 12). You will find that they were instructed to keep the passover (Abib 14) in Egypt and then leave on the following day (Abib 15). Lev. 23:5-6, Num. 33:2-3. “We can understand the wisdom of God in giving the children of Israel His True Time for He was showing them important feast days to keep and, as we will soon see. He was going to give them His laws to keep. “According to Num. 33:2-3 the children of Israel departed out of the land of Egypt on the 15th day of the first month (Abib). “There is an outstanding date given in Exodus. “Two and one-half or three million people had been on this journey for thirty days and all the provisions they brought had evidently been consumed and their condition became so desperate on this particular 15th day of the second month Zif, (refer to calendar), that the whole congregation of the children of Israel murmured against Moses and Aaron. They would rather have died at the hand of the Lord in Egypt. (Ex. 16:2-3). “Exo. 16:12: I have heard the murmurings of the children of Israel: speak unto them saying, At even ye shall eat flesh, and in the morning ye shall be filled with bread; and ye shall know that I am the Lord your God. be the morning of the 16th: the first day that manna fell in the wilderness. It is declared to us clearly that this is the first day of the week, for Exodus 16:22 says they gathered it every morning for six days. Also see Ex. 16:26. “God’s Seventh Day Sabbath Is Called Friday On Roman Gregorian Calendar. “Referring once more to the calendar, we use the ‘key week’ and find that we can trace forward or backward. Tracing backward, we find that the 1st day of the 1st month of the 1st year of a 3 year cycle comes on the 5th day of God’s week. the first year of the cycle always comes in on the day which the Roman calendar calls Wednesday. Actually God’s day begins on the previous evening (i.e. Tuesday evening, Roman time) according to scripture. Gen. 1:23. “Since Wednesday is the day of the new moon, and the new moon comes on the 5th day of God’s week then we can safely say that the 6th day falls on Thursday and the 7th day Sabbath of God’s Week is called Friday, Roman time. “A Bible day is from sunset to sunset. Thursday sunset to Friday sunset is actually God’s Sabbath.”—God’s Calendar, pp. 3, 7. These comments by the Friday-sabbath author on Exodus 16:1- 12 reveal that his position has as its basis the assumption that there is unbroken chronological continuity between the event of Exodus 16:1 and the events of Exodus 16:2-16. The reasoning is such as to make it appear that in the evening of the fifteenth day, the day the Israelites arrived in the wilderness of Sin, the quail came up, and that in the morning of the next day, the sixteenth, the manna fell. Upon this key premise the Friday-sabbath doctrine is built, and thereupon, it must stand or fall. Let us therefore, prayerfully scrutinize it through the all-searching lens of the Spirit of Truth in the word itself. under consideration reveals that the only day of the month Inspiration names is the fifteenth, the day of the Exodus’ arrival in the wilderness of Sin (Ex. 16:1). The scripture does not name the day or the month upon which Israel murmured; and it does not name the month or the day upon which the manna first fell, nor the day upon which the quail came up. These facts became absolutely evident when it is noted that not all the time elements of Exodus 16:2 to 12 are chronological or immediately connected with those of Exodus 16:1, the verse which deals with the day of Israel’s arrival in the wilderness of Sin. Verses 2 to 12 and on to 35 briefly recount only the most significant aspects of the most significant experiences which befell them during their forty years’ sojourn in the wilderness. Too, these verses make it equally evident that none of the events they recount took place on the days immediately following the Exodus’ arrival in the wilderness of Sin. Any careful comparison of the records will bear out that the events in point cover a considerable period of time, and that there is a gap in time between Exodus 16:1 and Exodus 16:2; also that, chronologically, even the events of Exodus 17 come between the events of Exodus 16, verses 1 and 2.
to be the fifteenth, the record does not name any other day at all in connection with either the falling of the manna or the coming of the quail, but simply points out that the one came in the evening (of an unrecorded day), and the other in the morning (of an unrecorded day). Furthermore, and again contrary to the theory, the manna came first and the quail came days later, as we shall now see. “We remember the fish which we did eat in Egypt freely; the cucumbers, and the melons, and the leeks, and the onions, and the garlick: but now our soul is dried away: there is nothing at all, beside this manna, before our eyes.” Num. 11:5, 6. “…say thou unto the people, Sanctify yourselves against tomorrow, and ye shall eat flesh: Ye shall not eat one day, nor two days, nor five days, neither ten days, nor twenty days; but even a whole month, until it come out at your nostrils, and it be loathsome unto you….” Num. 11:18-20. These and the preceding verses of the chapter definitely disclose that the quail came after the Israelites murmured against the manna; and that after they lost taste for it they became the more querulous because of their unbelief in the Lord’s ability to provide flesh food for such a great multitude. To their surprise, though “…there went forth a wind from the Lord, and brought quails from the sea, and let them fall by the camp, as it were a day’s journey on this side, and as it were a day’s journey on the other side round about the camp, and as it were two cubits high upon the face of the earth. And the people stood up all that day, and all that night, and all the next day, and they gathered the quails: he that gathered least gathered ten homers: and they spread them all abroad for themselves round about the camp. And while the flesh was yet between their teeth, ere it was chewed, the wrath of the Lord was kindled against the people, and the Lord smote the people with a very great plague.” Num. 11:31- 33. It is surprising, too, that he has failed to note that it was not in God’s purpose to feed His people with flesh at all during the forty years; no one could imagine that He was capricious to give them meat to eat right at the start, then abruptly to take it away from them and to put them on manna instead. Moreover had such been the case, then such, rather than the contrary, would have been the record. Also, it is understandable that just as soon as they saw that there was no way of making a living in the wilderness, they faithlessly envisaged themselves reduced to want, poverty, starvation, and death, and straightway began to recriminate Moses over their fearanticipated lot, and to cry out bitterly for sustenance, for food of any kind, rather than for a special kind. Being pitiful of their fears and mindful of their needs, the Lord sent them “bread [manna] from heaven.” Ex. 16:4. Soon, though, they tired of the manna, and began to murmur anew in lust for flesh food that was not for their good. Thus it was that, though contrary to His wise purpose for them, the Lord sent them quail (Ex. 16:8). Still, though, the manna as usual fell the next morning. So they then had both bread and flesh to feast on—yea, flesh to the fatal full (Ex. 16:12, 13; Num. 11:31-33). “Yea,” solemnly affirms the Psalmist, “they spake against God; they said, Can God furnish a table in the wilderness? Behold, He smote the rock, that the waters gushed out and the streams overflowed; can He give bread also? Can He provide flesh for His people?” Ps. 78:19, 20. The logic of the events in the sequence thus established by the Psalmist, gives corroborative evidence: (1) that the “bread” (the manna) came down quite some time after the fifteenth day; (2) that it came after their second advance into the wilderness of Sin—as far as to Rephidim (Ex. 17:1), the place where Moses struck the rock which then gave water; and (3) that the quail came into the camp still after that. To restate it, first came water from the rock, then came down the manna, and after it came the quail. The Psalmist’s inspired statement—“Behold, He smote the rock; can He give bread also? can He Provide flesh for His people?”—declares that the Lord had already caused the rock to give water even before they faithlessly cried out their doubt of His ability to give them bread and that next they cried out doubt of His ability to give them flesh! events recorded there cover a period of time (all the days of their wanderings in the wilderness of Sin) rather than simply a few days following their arrival in the wilderness of Sin. The events of the chapter include even the spying out of the land, also the giving of the “Testimony” of the Lord (the law) from Sinai, as well as the building of the tabernacle and the furnishing of it (Ex. 16:33-35; 40:2-6). All these events are recorded in the same chapter, although as we have already seen, the first event chronologically to follow the event of the fifteenth day—the day of their arrival in the wilderness of Sin (Ex. 16:1)—was Moses’ smiting the rock at Rephidim (Ex. 17). the fourteenth day of the same month: and the whole assembly of the congregation of Israel shall kill it in the evening.” Ex. 12:3, 6. Carefully mark, the command specifically exacts that the sacrificial lamb be separated from the flock on the tenth day of the first month, kept alive but up to the fourteenth, not up to the thirteenth, then killed in the evening of the same day, that is, the lamb was to be killed toward the end of the fourteenth not at the beginning of it. The margin places the time of killing the lamb “between the two evenings.” Biblically and traditionally the one “evening” is the time after the noon sun begins to decline—the afternoon, after 1 P.M.; the other “evening” embraces the period of dusk, from the time the sun sets to bedtime. These two limits fixed the hours for all the preparations. Thus Israel made all these preparations during the fourteenth day then ate the sacrifice during the night of the fifteenth day (Ex. 12:18; Lev. 23:6), the very night of the season in which, as the Bible plainly states, they not only ate the Passover but also left Egypt (Num. 33:3; Lev. 23:6). To make this important fact graphically clear, we subjoin the following diagram. Just how, therefore, in view of these clear-cut Biblical records, one can possibly conclude as the Friday-sabbath author does, that the Passover feast was celebrated at the end of the thirteenth day (which according to Biblical reckoning* would be the night of the fourteenth day), although the Scriptures specifically state that it is celebrated during the night of the fifteenth day is indeed beyond all fathoming. Not only the Bible’s decisive explicitness concerning the time for this important celebration, but history and tradition as well, make virtually impossible anyone’s missing the facts. Yet in spite of this and contrary to it all the Friday-sabbath author is led into rationalizing a one-day cutback of events—back to the thirteenth day—in order to tailor the time to fit the theory. Since he must have read the Bible through, then it is difficult to escape the conclusion that the error seems not so much a matter of misinterpreting, as a matter of deliberately side-stepping. *The dark part ahead of the light part of the day. and resurrection, and with his “quail-manna” theory, he builds up the Friday-sabbath doctrine, obviously not reckoning with the inevitability that one day Truth must storm its sandy foundations and topple it to the ground. It will now be observed that in order to prop up the Fridaysabbath theory, the author of it was forced also to try to match the day and hour of Jesus’ death with the day and hour in which the Passover lamb was killed. Thus he was forced into shifting back the time of the Passover feast from the fifteenth to the fourteenth day of the month, although contrary to the Scriptures! By such maneuvering and rationalizing, the author has the Passover lamb killed and Christ crucified on the same day, the thirteenth, Wednesday. So he goes on to explain that Jesus could not have been alive to celebrate the Passover. He then rationalizes Matt. 28:1 into placing the resurrection on the seventeenth, Saturday evening. But even after all this manipulating, he is not able to match the time of the events, for although he contends that the Passover lamb was killed at sunset, yet he has to admit that Jesus was crucified between sunrise and noon-day—at “the third hour.” Mark 15:25.
with them the Passover feast on the fifteenth, Wednesday night (Mark 14:18); that He was arrested that same night immediately after the Passover celebration, then tried by Annas and by Pilate, and crucified and buried at about sundown (Mark 15:42-46) on the sixteenth, Friday; finally, that He arose on the eighteenth, Sunday, the first day of the week (Mark 16:9). Indeed, the Friday-sabbath author seems utterly to ignore all these Biblical records of the events. And in this he shares in common with all the other threedays- and-three-nights Scripture-perverters. Further, the Sanctuary law demanding “seven sabbaths” from the day of the sheaf offering to the Pentecost (Lev. 23:15), absolutely eliminates the possibility of any day other than the seventh-day Sabbath to precede the day of the sheaf offering and thus the resurrection, and the Pentecost. That is in order to get seven Sabbaths within 49 days and have the 50th day come on the day after the Sabbath (Lev. 23:16), on the first day of the week, one has to start counting from the first day of the week, Sunday. No other day will do. Try it and see. Consider, too, the tradition of celebrating Easter (the resurrection) on Sunday. In spite, though, of all the light on the subject, there is scant hope that these perverters will stop arguing themselves out of the Sabbath blessing! during the dark part of the day, (4) that it was at the sixth hour during the light part of the day that darkness covered the earth while Jesus was hanging on the cross (Matt. 27:45), (5) and that since the sixth hour in which He was led into Pilate’s Judgment Hall was before the crucifixion, then it inescapably follows that the sixth hour before the crucifixion was either Thursday noon or midnight the sixth hour in the night between Thursday sunset and Friday sunrise. Why could they have brought Him to Pilate by night? For the same reason that they had Him arrested and brought to Annas and Caiaphas by night—that is, because they feared the people, for many believed in Him, and they wanted therefore to keep quiet their dark work, so as not to create commotion or opposition. This is the Bible’s own hour-by-hour record of the time of these events, and in perfect accord with it is the traditional and historical celebration of the same events. Since the chronicled hours, from Jesus’ arrest and trial to His resurrection, bear indisputable record of a total 72 hours, and since those who buried Him returned home and kept the Sabbath according to the commandment (Luke 23:56), and also since we are told that He arose on the first day of the week, Sunday (John 20:1-8; Luke 24:1-7; Mark 16:1-6), there is therefore no slightest Bible justification for anyone’s concluding wrongly concerning the day and the hour of each event and the total hours consumed. Finally, since only the Bible tells the exact and whole truth, then any voice to the contrary is that of the Deceived, the Devil, plotting to discredit the Bible and to trap someone somewhere. into the grave to the time He was to arise from it. Rather, He meant from the time the Sanhedrin was to take Him into custody, to the time the stone was to roll away from the tomb in order for Him to arise therefrom (Luke 24:7). Moreover, since the Sanhedrin was the headquarters, the heart of the church, thus the heart of the earth in its time, and since Christ was in its custody three days and three nights (for the Sanhedrin set a watch over His body even while It rested in the tomb), then the Sanhedrin, the church, is what He termed “the heart of the earth.” And who can honestly deny the correctness of the figure, considering that, as the Scriptures teach, the earth still stands only because the church, the heart of the earth (the transmitter of spiritual life), is still functioning in an effort to impart eternal life to it? The church (with Christ in it), not the grave, is in every spiritual sense the heart and the life of the earth. Indeed, no understanding mind could ever regard the grave to be “the heart of the earth”, much less, then, could the Lord so regard it. The enlightened mind well knows, too, that the grave is not the generator of life, but the container of death, and therefore can never be called the heart of the earth, no, no more than can a man’s carcass be called his soul. being a living creature that safely transported Jonah’s life through the deep, must be figurative of something living, not of a grave, an inanimate thing, that itself is figurative of eternal hell! What, then, could the whale possibly be figurative but of the old ship Zion on voyage over the savage sea of sin, to the City Eternal! O, how plain, how sure, how stirring! The whale’s failing to do away with Jonah, but rather taking him safely to shore so that Nineveh perish not, typifies the Satandominated Sanhedrin’s failing to do away with Jesus, though fulfilling the prophecies “that one man should die for the people, and that the whole nation perish not!” John 11:50. And just as Providence permitted the ship’s crew to plunge Jonah into the sea for the sake of the ship’s safety and for their own lives’ sake, as well as for the sake of Nineveh, so Providence permitted the mob to take Christ and to nail Him to the cross for the sake of His church and her captive members, as well as for the sake of the lost world. Since in the belly of a hunger-stricken whale God safely carried Jonah through the depths of a stormy sea, and since in the hands of a blood-thirsty church He safely bore Christ through the depths of sin itself, thus even so today will He safely bear through the depths of hypocrisy, ism-corrupt Christianity, and pleasure-loving society, every one who does as did both Jonah and Christ. God will do as much for all today, even though they be in the grip of a money-mad, prophet-hating, and self-satisfied (lukewarm) ministry. Yes, He will safely transport all such to the shores of Mount Zion, there to stand with the Lamb. However, those who do follow the example of Jonah and of Christ, will for certain find themselves among the “outcasts” for Truth’s sake. But thanks be to God that no one, priest or prelate, can deprive them of feasting on meat in due season, on timely truth, especially adapted to meet their particular needs. Thus all who awake to their Laodiceanism, and to their duty to proclaim God’s Truth for this time regardless of consequences, will triumphantly and jubilantly land on the shores of eternity! to be plunged into the fiercest of sin tempests, there to be mocked, nailed to a cross and put into a tomb, for the sake of the Church and the captive members, and thus for the world, is the antitype. Christ’s descending to earth to save its inhabitants at a time when Satan had taken complete control not only of the world but of the Church too, and thus expected therein to forever make rid of the only Saviour as soon as He should appear; also Christ’s breaking through Satan’s defense lines, re-establishing His Church communication lines the world over for His people to come in, is His glorious victory. These are the lessons which the Lord wanted to convey to the Jews through the Jonah-whale allegory, and these are the lessons which He especially wants to convey to us. The theory, though, of three days and three nights in the grave brings no lesson of any kind, to any one. It is now clearly seen, too, that to construe Christ’s statement, “three days and three nights in the heart of the earth,” to mean His going into the grave, is calculated not only to do away with the Holy Sabbath but also to exclude the significance of His trials and sufferings, to cover up the lesson which the Inspired figure, “the heart of the earth,” teaches. of the Friday-sabbath builder batter itself to pieces against the immovable foregoing concrete facts. Even with employing his own distorting way of figuring, he fails to get a Friday for the Sabbath. Where he really gets Friday instead of Saturday for the Sabbath, is in the following two paragraphs that are absolutely of his own fabrication. “This new moon showing the first day of the first year of the cycle always comes in on the day which the Roman calendar calls Wednesday. Actually God’s day begins on the previous evening (i.e. Tuesday evening Roman time) according to scripture. Gen. 1:23. “Since Wednesday is the day of the new moon, and the new moon comes on the 5th day of God’s week, then we can safely say that the 6th day falls on Thursday and the 7th day Sabbath of God’s Week is called Friday, Roman Time.” God’s Calendar, p. 7.
year the pattern he fancies it follows. With the subject in question now alight like “the burning bush,” it is our devout hope that both the author of the Friday-sabbath doctrine and the victims of it will readily see that a Friday-sabbath is just one more case of ism-sprout now at the eleventh hour, just one more Enemy endeavor to draw minds away from the Lord’s saving message, and to confuse, confound, and disgust both believers and prospective students of the Bible. 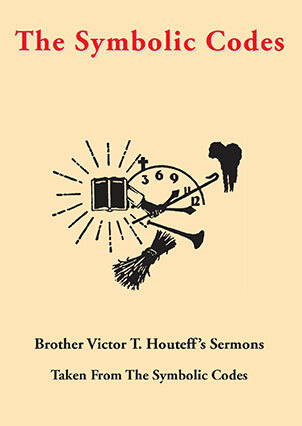 It is therefore our earnest prayer that the author of the Friday sabbath, along with his victims, will now rejoice that the Spirit of God has again reproved error and caused Truth to shine forth brighter than ever; not simply exposing just another false theory, but actually doing away with another Enemy attempt again to “take away the Daily,” and again to put in its place an “abomination that maketh desolate” (Dan. 11:31); this time not by endeavoring to set up anew the day of Romanism, but actually to foster the day of Mohammedanism! May you, Brethren, who have been trapped by the Fridaysabbath ism, now rejoice from the depths of your souls that “the Spirit of Truth” has made possible your escape from the Enemy’s stronghold. May you not for even one fleeting moment delay your flight from it, lest you frustrate the grace of God. You now see, I am sure, that the so-called “Key to God’s Week,” instead of being the key by which to unlock proof that Friday is the Sabbath is actually the key by which to lock up the error and set its captives free. Since through the Rod (Mic. 6:9; 7:14), Inspiration has at this very time amassed unparalleled prophetic proof of the onrushing approach of “the great and dreadful day of the Lord” (Mal. 4:5), what, then, could be more inevitable and more certain than that Satan would unleash upon Christendom his most vicious pack of Bible perversions? It is therefore not surprising to hear the loud barking of “greedy dogs,…shepherds that cannot understand” (Isa. 56:11), endeavoring to draw away attention from the most weighty concern ever to confront mankind—the all-consequential truth that “the great day of the Lord is near, it is near, and hasteth greatly, even the voice of the day of the Lord: the mighty man shall cry there bitterly.” Zeph. 1:14.
if possible. But the Spirit of God works, too revealing Truth to expose falsehood, so as to safeguard the faithful who want to know the truth at any price, and who want to obey It regardless of consequences. In the next issue of the Code, there will appear two questions and their answers. One question will pertain to Sabbath observance at the International Date Line; the other will pertain to the question of whether the Sabbath is governed by the lunar month or by a independent weekly cycle.